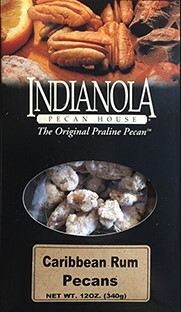 12 oz Box Caribbean Rum Pecans - take it to the Caribbean with this fruity twist on our gourmet pecans! Take your mouth on a vacation with our Caribbean Rum pecans. Our gourmet pecans take you places!